Rich: Do you think that some of the charm techniques – for lack of a better phrase – that you employ as part of what you teach, is it easier to project that in a podcast than it might be in a blog for you? Jordan: Yeah. I’m very expressive on a microphone. Writing, I find it fun but still kind of tedious and time consuming. I know that writers probably write like I talk where it’s just there and then a couple of edits later it’s fine. That’s essentially the process for me. But I find that I like to drink and look people in the eye while I’m having these conversations. I don’t like to sit and stare at a computer screen. So writing for me, my attention span and skillset didn’t match. However, the podcasting – the microphone – was really well suited to me, and very well suited to the interview process which is what our show became. Originally it was just me and AJ talking, and now it’s interviews with experts from every possible field. I mean show business, productivity, nonverbal communication experts, dating folks, people with incredible stories, folks that talk about anything to help make us humans perform better is what we talk about. So that’s much more conducive than just writing articles about it, that would be a tall order for me especially. Rich: And I think I came on the bandwagon when you guys were already doing interviews, so I hadn’t heard a lot of those earlier shows. Have you learned anything about the podcasting process that’s either built your audience up or gotten you more listeners or just created a better relationship with the people on the other end of the iPod? Rich: Would you care to share any of those with us? Jordan: Sure. I’ll tell you, one of the most common mistakes I see with people who are writing or talking on a mic, they do this. So, do you ever read an article where the writer is your friend and when you read it you’re like, “What am I reading? It’s full of big words, it’s really complex and pretentious and strange and it’s hard to decipher.” But when you talk to the guy in real life, they’re proud of their masterpiece but on the other hand, they don’t really talk like that so why would they write like that. It seems totally weird. Do you ever see an article like that or anything? Rich: Absolutely. Although I do listen to NPR, so I’m a pretty pretentious prick anyways. Jordan: Yeah, it sounds like it. But I talk just like I talk in real life life, and people are always surprised about that. And when I write, I pretty much write just like I would normally talk. And the problem that I see with podcasters is they do what a lot of writers do. Instead of going, “Hey guys, welcome to The Art Of Charm, this is Jordan Harbinger and today I’m talking to my friend, Rich Brooks. We’re going to be discussing…. ”, instead they go, [said in an annoying voice] “Hey, what’s up everybody? I’m Jordan from The Art Of Charm. [explosions] I’m talking with Rich Brooks…” And it’s just too much to deal with. Rich: Crap, now I’m going to have to go back and re-record your intro. Jordan: Yeah, exactly. This is why we like what we call “white girl yoga pants”, when they say, “I can’t even”. Do you ever hear that expression? Rich: I’m embarrassed to say I have not. But people do that all the time when they interact with each other socially. They try to talk about things that make them look cool. They try to name drop. They do all this stuff and all they’re doing is overcompensating, and/or, putting on this mask. They’re wearing clothes they wouldn’t normally wear, they’re telling stories that they normally wouldn’t tell or that are just fabrications. And that’s a problem because that alienates people from you and people do that a lot in the way that they write and in the way that they broadcast, but unfortunately they do it in the way that they talk with other people, too. And so that’s where authenticity just runs through everything that you do. So if I had to put it down to one word to create better relationships with people – including your audience – “authenticity” would be there at the top of the list. Rich: Alright, that makes a lot of sense. Of course I did tell a hugely embarrassing story, so I don’t know if I get any authenticity points for telling that I used to eat cookies in the men’s room so I wouldn’t have to sit by myself alone at lunch. I don’t know, does that count for anything? Jordan: Yeah, I don’t know. Maybe too much. You know what though? You can get there eventually. Rich: What other tactics or tips do you use to build up the podcast, and/or, how do you get your podcast listeners to come out to LA and take one of your courses? Jordan: Well, they call the number on the website, they email me at Jordan at the Art of Charm dot com. And also, I have testimonials and little “commercials” in the show itself, but I think people who start to apply the tips that they learned on the show and the knowledge, they start to go “Ok, I’m learning this in an audio only format. Obviously there’s going to be a lot more that I can learn in person.” And that’s a big deal. That’s something I want to make sure that everybody knows and so that’s really the call to action. I don’t email tons of stuff out, I don’t really focus too much on any type of conversion process because people who are really interested will reach out. I don’t want a sales funnel full of people that feel like they got tricked into a free consultation. I don’t do that because I don’t want to do free consultations, I want people who want to be here. I get enough of those already that duping people into coming in is not a good strategy. Although I will say in the beginning of the business we tried really hard to figure out how to get people to give us contact info, but that just turned out to create lots of work for a lot less return on investment. Rich: That’s interesting, because of course so many people that I’ve interviewed in this show – which tends to be more on the digital marketing side – building their list is their #1 thing, and it’s been very good for my business as well. But what I’m hearing from you is there’s also a double edged sword here – where maybe it’s for your type of business – but you need people who have already bought into the system. They’ve gotten maybe some small win, and all of a sudden they start listening to you regularly and then at some point decide to take it to the next level, so maybe they decide to buy one of the courses or go out and meet Jordan personally, something like that. A lot of email marketers do this sort of thing – I don’t know if it’s called negative marketing – but it seems really negative where it’s scarcity-based. I don’t like that because it’s not true, you’re not taking your digital offer offline because they don’t want you to see it, there’s no conspiracy from scientists that don’t want you to know how to lose weight or become more charismatic or get more dates or whatever it is. You don’t see that stuff. Rich: I haven’t seen that last one, the other ones, yes. Jordan: The server error one, people will say, “Oh, our website got so many hits yesterday that our server crashed today, so in case you couldn’t watch it, here it is again.” Like, as if I’m helping you watch my sales video again because so many people saw it yesterday that the server crashed. The server didn’t crash, you just wanted to mail it out again. Literally, why don’t you just tell people that? But if you’re that dumb, I don’t want you in my livingroom, because it’s going to be hard to teach somebody who believes those things. So I don’t like that. Maybe I’m just behind the learning curve. This is the naivete where it’s like you’re 25 and want to save the world and the environment, maybe that’s where I’m at with email marketing, but I don’t thinks so. Its been working ok so far. Rich: Well I think the bottom line is you could probably maximize your revenue or your returns on some level, but at the same time reading over the material that you have that we talked about today and the stuff that’s on the website, authenticity is very important to you. So you can’t talk about being authentic and then use psychological tricks. Well, we all use them, let’s be honest, but there has to be a line in the sand that you’ve obviously drawn that you won’t step over. How can I teach you to be the best possible person if I’m not even following my own rules? Jordan: Yeah, it’s tough. You can’t uphold certain values and then break them trying to sell people a product that teaches them those same values. It doesn’t work. Rich: So a lot of the stuff that you’ve talked about, obviously, I think what a lot of the guys are attracted to was the idea of being able to attract women. But a lot of the other stuff that you are talking about is just general life stuff. Like how to be a better person, how to be better at home, better at marriage, better in the workplace, correct? Jordan: Yeah, these a wide variety here. We talk all about relationship development, showing up really well, personal magnetism, charisma, things like that. Networking is a huge one. I can’t be like, “Give value to people, be kind to others, leave everyone better than you found them”, and then repeatedly spam their inbox and tell them to buy something or they’ll die. It doesn’t work. Rich: Alright, so before I let you go, share with us one tactic that some entrepreneur can use at a networking event, maybe it’s a local event, maybe it’s a conference like that, he or she doesn’t know anybody and they’re not wearing a kangaroo suit. What one piece of advice can you give them to make that day a little easier, a little better and make a few more connections? Jordan: I’ll sort of back up the truck because good first impressions are not made when you open your mouth and say a really clever, cool thing that a lot of people seem to think is the case. 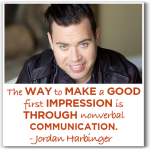 The way that a good first impression is made, you will have a nonverbal impression. Let’s say you’re walking into an event, you can’t talk to everyone at the same time, so you make that first impression when you come up on other people’s radar. 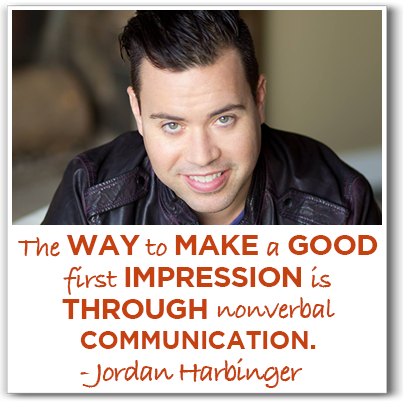 And since you can’t talk to everyone at the same time, the only way that you can make a good first impression is through your non verbal communication. And the way that you can do that, you can’t be talking to someone focused on what they’re saying, worried about what you’re going to say next, worried about if you‘ve got good posture, worried about whether you look open or smiling, whatever. So you need to build those things in as habit and internalize them. And the way that you can start doing that is every time that you walk through a doorway, straighten up your back, shoulders straight, head held up high. And don’t exaggerate it, you’ll look like an idiot if you do that. But if you do that everytime you walk through a doorway- and I don’t mean outside, but in your own house – once you start doing that for a couple weeks with a smile on your face, head held high, shoulders back, chest out. You’re going to go to Starbucks to get coffee and “boom”, your posture is going to be great, nonverbal communication is going to be great, big smile on your face. That’s huge, that’s a huge plus. And the reason that happens is you’re starting to build a habit. And when you have that as a habit you don’t need to think about that anymore, which means that you no longer need to worry about whether you’re doing that and you can focus on other things consciously, such as meeting other people and creating a good first impression verbally and focusing on the conversation. Basically we’re big wads of good and bad habits, so if you have really great nonverbal communication, people are going to treat you like a confident person that has great nonverbal communication. They’re not going to go, “Look at the nonverbals on that guy! He must be confident.” It’s all subconscious, and that’s the best part. Persuading people to do something or believe something is really easy if they don’t even know it’s happening, it’s all nonverbal cues. If you walk up to people and say, “I’m confident”, they know you aren’t. But if you walk into a room and you look confident, people will assume that it’s true. So if you can build confidence as a habit, it becomes who you are and people will treat you as such. And that’s a huge advantage in life. Rich: I absolutely agree. Both as the person coming in with confidence, but also it’s like who isn’t more attractive to people who are confident? That could be almost the most attractive quality of most any human being on the planet, both male and female. When there’s confidence there, that’s something that almost everyone is attracted to and is drawn to. Jordan: Yes, absolutely, I mean, there’s nothing more attractive than confidence, and if you ask somebody who can’t articulate what they like very well, they will say “confidence, sense of humor”. Rich: Those are the top two. Jordan: But they are very vague and not very helpful because people go, “Cool, how do I do that?” And people say, “Just be yourself.” Damn it, we’re back at square one. Nobody ever says, “I want somebody that’s really mousy and not confident.” So we need to find out what it is and how do we develop it, and that’s what we do at The Art Of Charm. Rich: Perfect. Which leads us, since we’re basically at the end of our time. I’m sure a lot of people are intrigued by the stuff that you’ve shared with us today, where can we send them so they can get some more information? Jordan: TheArtOfCharm.com is a good place for that, but if you’re listening to a podcast – which, by the way, you are – you can go and look for The Art Of Charm, and that’s essentially wherever podcasts are sold. Rich: Excellent. And we’ll have links over to everything Jordan shared with us today – including his podcast – in the shownotes, so be sure to head over there. Jordan, I want to thank you very much for all your time today. Jordan: Thank you, man, I appreciate it. Check out Jordan’s website to find out more about him and what exactly it is he does. Got a question for Jordan? Send him an email! Listen to Jordan’s podcast to learn some of his tricks and secrets.